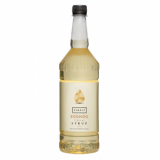 Sweetbird eggnog syrup in a 1 litre plastic bottle is absolutely festive - sit by the fire and enjoy the creamy, nutmeg flavours this syrup brings to your coffee. Designed to flavour drinks such as coffee, hot chocolate and frappes. Versatile - use in baking, cocktails, desserts and sauces. Free from artificial colours and preservatives; GMOs and high fructose corn starch. Approved by the Vegetarian Society and Viva! For Vegans.